Saxon Switzerland, with its National Park as part of the sandstone mountain range of the river Elbe, is just waiting for you to visit. Strangely shaped rocks, hidden caves and deep forests will enchant and inspire you. 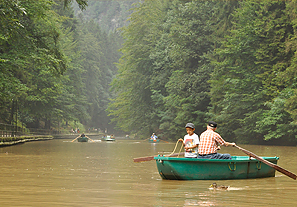 Get ready to explore this unique vacation area on foot, bicycle or by rubber boat on the Elbe. The sandstone mountain range of the Elbe is a low mountain range composed mainly of sandstone situated around the upper course of the river in Saxony (Germany) and Northern Bohemia (Czech Republic). The sandstone mountain range of the Elbe is a low mountain range. It incorporates heights of up to 723 meters above sea level. The area covers a surface of about 700 square kilometers, and is called Saxon Switzerland on the German side, Bohemian Switzerland on the Czech side – or simply “Saxon-Bohemian Switzerland”. Ostrau, situated on the flat, meadowy highland area called “Ostrauer Höhe”, is located at a height of up to 251.7 meters above sea level. Since 1904 it has been directly connected to the beautiful health and leisure resort of Bad Schandau by a freestanding electric elevator, which was built on the initiative of the hotelier Rudolf Sendig. The image of the town is characterized by a modern health and wellness clinic (“Falkensteinklinik”), old timber-framed farmhouses, pensions, inns, single-family homes and Scandinavian-style wooden villas, further results of R. Sender's work. The “Schrammsteine”, regional wild rock formations, near the village of Ostrau provide impressive evidence of the formation of monumental rock massifs in the sandstone mountain range of the Elbe. The National Park of Saxon Switzerland spans the core areas of the Elbe sandstone mountain range, covering a surface of 93.5 square kilometers in the state of Saxony. The National Park of Saxon Switzerland spans the core areas of the Elbe sandstone mountain range, covering a surface of 93.5 square kilometers in the state of Saxony. The communities of Bad Schandau and Altendorf represent the borders of this area in the west. Ostrau is situated directly on the border of the Saxon Switzerland National Park. The strongly diverse structure of the landscape causes extreme climatic distinctions. The deeply cut, canyon-like ravines that stay cool even in summer form a contrast to the hot, partially bare and treeless stone reefs. Deciduous woodlands, greatly consisting of oaks and hornbeams, spruce forests, reef pine forests on freestanding rock reefs and the occasional detached silver fir constitute the predominant tree population of the Saxon Switzerland National Park. You may also come across small wetland meadows, diverse ferns and blueberry shrubs. The large, thick forest area of the National Park is a home to many kinds of animals. Amongst others, owls, hawks, black storks, kingfishers, several types of bats, wild boars, red deer, European adders, grass snakes, trout and salmon may be encountered here. The Czech part of the Elbe sandstone mountain range, which is called Bohemian Switzerland (Czech: České Švýcarsko), lies just north of Děčín on both sides of the Elbe. It borders on two other mountain ranges, the Lausitzer Gebirge in the east and the Erzgebirge in the west. 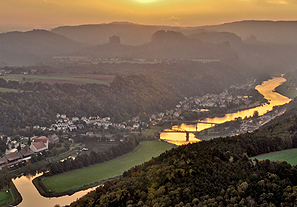 The area on the right side of the Elbe has been the Bohemian Switzerland National Park since the year of 2000. The precious forest and rock landscapes, the gorges of the Kamnitz River and the area around the mountain Rosenberg were hereby placed under protection as a national park. The administration of the national park is based in Krásná Lípa (“Schönlinde” in German), information centers can be found in Hřensko (“Herrnskretschen” in German) and Jetřichovice (“Dittersbach” in German). In contrast to Saxon Switzerland, the image of Bohemian Switzerland is not characterized by mountains. The flat-topped mount Hoher Schneeberg (Děčínský Sněžník) and the basalt summit of the Rosenberg (Rúžovskývrch) are two exceptions. The Prebischtor is largest natural sandstone rock bridge in Europe. In the year of 1888, the first climbing rock of Bohemian Switzerland, the Beckstein, was made accessible. Other well-known climbing rocks in the area are: Großer Prebischkegel, Nonne, Doggenturm, Empornadel, Wotanskegel and Kastenturm. The founding of the national park caused climbing sports to be at first restricted, then later completely banned. Nowadays however, climbing is permitted during certain periods of the year. Several castles can be found in Bohemian Switzerland, which were originally constructed for the protection of trade roads, or used as robber's nests during the Middle Ages. The formerly Slavic region was settled by Germans until the end of World War II. Today, the area's population is almost exclusively Czech. Sights of interest in Bohemian Switzerland include the Prebischtor – the largest natural sandstone rock bridge in Europe, the ravines Edmundsklamm and Stille Klamm, the Tyssaer Wände, the castle Felsenburg Schauenstein, the Marienfels, the Wilhelminenwand, the Rudolfstein, the Paulinengrund, the castle Felsenburg Falkenstein, the stone chapel in Všemily, the Belvedere near Labská Stráň, the Small Prebischtor, the Balzhütte and the Kaiseraussicht on the Quaderberg near Děčín. Last but not least, the Czech capital should not be forgotten – the golden city of Prague, about 110 kilometers away from Bad Schandau and easy to reach via the A17 highway or by train. There is no doubt – you will succumb to the charms of the Saxon state capital, Dresden! Dresden is a vibrant city of art of culture which has managed to harmoniously meld modern and baroque architecture. Since its first documented mentioning in 1206, Dresden's history has been fascinating and full of changes. Under the leadership of August the Strong (1670 – 1733), the city experienced a cultural upsurge, thanks to which , amongst other things, the grand baroque buildings, such as the Dresden Zwinger Palace, the Frauenkirche church or the castle Moritzburg, were constructed. Museums and galleries, operas and theaters, shopping centers, cinemas, bars and night clubs, sports centers and arenas, impressive churches and the Dresden Zoo top off the image of this Saxon major city. Be sure to schedule enough time for this beautiful city, and to experience Dresden's atmosphere by night as well! Dresden is a vibrant city of art and culture. Its baroque and Mediterranean architecture got Dresden its nickname of the Saxon “Florence on the Elbe”. As already mentioned in the name, Dresden is situated directly on the river Elbe and is, with its population of 500,000 and 63% of its surface covered in green meadows or forests, one of Europe's greenest major cities. The area around the Brühlsche Terrasse is a real cultural hub. Countless attractive sights, such as the Albertinum with its picture gallery “Neue Meister” (“New Masters”), the treasury of sculptures and antiques and the armory, are located here in the immediate vicinity. Enjoy long walks on mild summer nights through the Münzgasse, with its countless bars and restaurants and its beautiful view of the Frauenkirche, the emblem of Dresden, or take a stroll over to the theater square, with the famous Semper Opera House and the impressive park of the Dresdner Zwinger palace, also the home of the picture gallery “Alte Meister” (“Old Masters”) and porcelain collection of Dresden. The castle Schloss Pillnitz, not far from Dresden, with its baroque pleasure garden and generous park, is a further achievement of August the Strong's. Be sure to stop and admire the 230 years old and over 8.9 meter high camellia tree. Make sure to plan in enough time for your vacation in Saxon Switzerland. There are plenty of activities, attractive sights and scenic beauties to be seen and experienced here and our organic pension in Ostrau is the ideal choice of a starting point for your outings. The city of Bad Schandau is about fifteen minutes on foot from Ostrau. This health and leisure resort, with its medieval center and its cozy little cafés, restaurants and boutiques, is a wonderful place to spend time. Saxon Switzerland is one of the most interesting hiking areas in all of Germany and provides a wide range of difficulty levels for your chosen route – you can find everything from wide forest paths with slight rises to steep climbing trails. 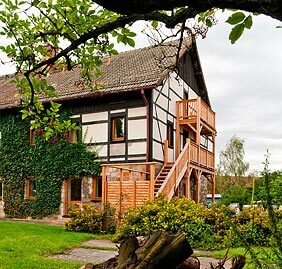 Olaf Schmidt, the owner of the guesthouse, will be happy to give you detailed advice on hiking destinations and routes in Saxon and Bohemian Switzerland. Hop onto your saddle and get to know our region by bicycle or e-bike. The well-developed bike path invites you to go exploring along the Elbe, for example on a tour from Bad Schandau towards the Czech border. If you prefer hilly grounds, you'll be sure to find plenty of attractive tours with breathtaking views of Saxon Switzerland. If you don't have your bike with you, there's no problem whatsoever. Plenty of possibilities for renting bicycles and e-bikes have been provided for. 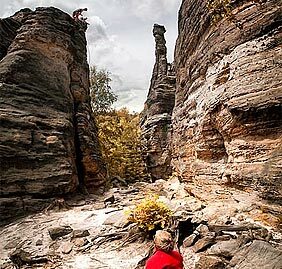 The sandstone mountain range of the Elbe offers the climber breathtaking settings as well as challenges. There are over 1,100 freestanding sandstone rocks with difficulties from I to XII to be climbed. A strict ethical climbing code is, however, to be applied here, the contents of which can be found in the Saxon climbing rules in force since 1913. The use of safety agents and other devices is fairly restricted here. Get ready for pure relaxation at the Toskana Therme thermal baths of nearby Bad Schandau. Your senses will be enchanted by the unique composition of lighting, water, sounds and colors. Simply enjoy the wide choices of wellness and beauty treatments – and how about following up with a romantic dinner for two in one of the nearby restaurants? After a vacation day like that, you will definitely have a wonderful sleep in our country house style rooms so you can start the next day well-rested and relaxed with a copious, whole-food organic breakfast buffet. There is no doubt – you will absolutely adore Saxon Switzerland! Painters such as Caspar David Friedrich and Ludwig Richter already found themselves fascinated by the Elbe sandstone mountain range's wild romantic beauty, which they captured in their paintings. But don't just take our word for it, see for yourself – get a first impression with our picture gallery.